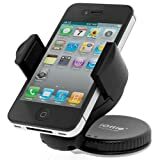 iOttie "Easy-Flex" car mount holder is designed with functionality as the main focus. iOttie "Easy-Flex" windshield mount is extremely compact, has a super strong suction cup that will stick to any glass surface. The holder base and the bracket arm rotate 360 degree for virtually any position that is needed. It can be mounted in less than a minute and is also heat resistant. Rather your phone has a skin or a case on, big or small; it will hold your phone in place and allow you to adjust the angle any desired direction.